My first baby (Blue Eyes) turned four a few days ago. It’s crazy to me that time has passed so quickly. It seems like yesterday I was huge, pregnant and terrified at the idea of giving birth to him. 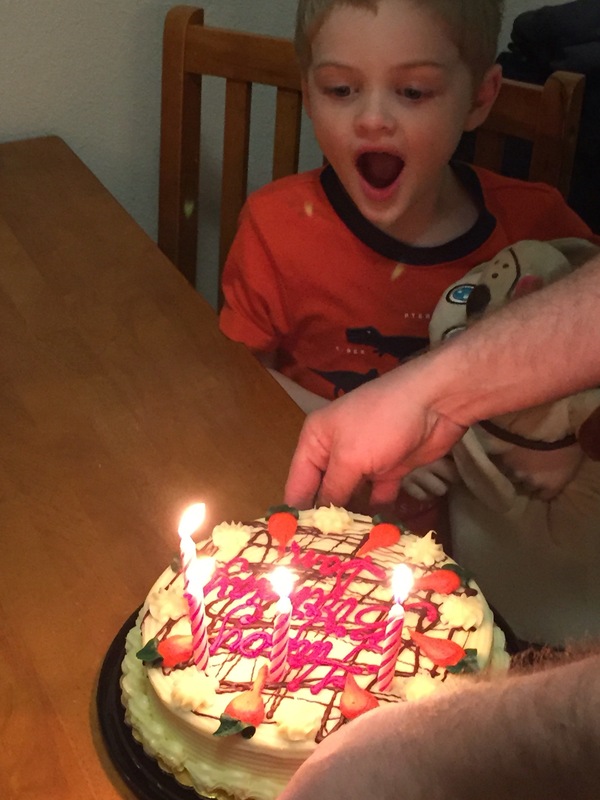 Now he’s four. This year has been crazy. We survived daddy being deployed. We dealt with the behavior regressions, and jealousy. 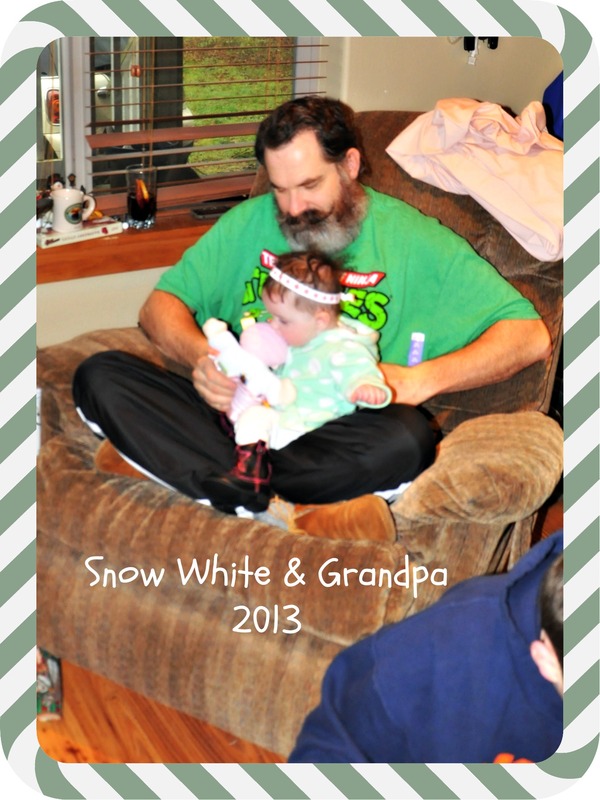 We excitedly welcomed a baby brother and discovered that Snow White is our best friend. We love power rangers, dinosaurs, and spiderman. Much to daddy’s dismay Star Wars is not the coolest anymore. Teddy bear puppy is no longer the favorite. We now have shuebert. The doggy who can hold the iPad. The blanket I panicked over making a replacement has been replaced by a thin red blanket that is his favorite color. Nap time is a struggle. I’ve thought about getting rid of it, but he still can’t make it through the day without one. In fact I’m sitting at the bottom of his bed making him close his eyes. Time has changed. Snow White is now a busy two year old. She loves to sing, but we struggle with speech. She’s been in speech therapy for about six months. It’s a struggle to teach her things like potty training because of the lack of talking, but we are learning sign language and she’s starting to use some words. Baby boy is mobile! Just today I put him in the living room to play. I walked over to help Snow White with lunch, only to find him crawling into the kitchen after me. Sadly blackjack passed before the holidays. Domino was so lonely and depressed (as was daddy and blue eyes) that we ended up getting a puppy. We named her Bones. I remember why I didn’t want a puppy, but the joy she brings to the house is undeniable. Yep. Time is changing and passing. And since blue eyes finally closed his eyes long enough to fall asleep, I think I shall catch up on dishes and the millions of other housework chores that have been neglected. 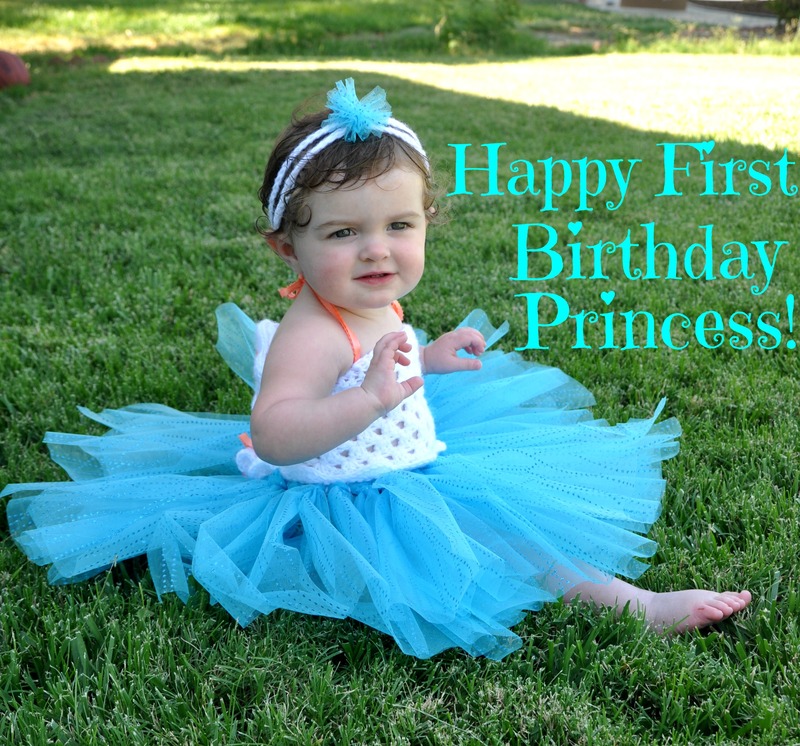 Posted in Uncategorized and tagged baby, birthday, blue eyes, change, growing up, snow white. Bookmark the permalink. Posted in Uncategorized and tagged babies, baby, baby boy, blogging, blue eyes, brothers, deployment, photos, siblings, sister, sister and brothers, snow white. Bookmark the permalink. We’re having a baby… and daddy’s deployed. I’m seven month pregnant now. It feels like it’s just flying by. I actually feel better this pregnancy than I did with my first two, and I’m pretty sure I have my first two babies to thank for that. I run after them constantly. The result is a slightly fitter mommy, and I haven’t gained a whole lot of unnecessary weight. I’m tired, but honestly, what pregnant lady isn’t tired? My kids are acting up, but once again, what kid doesn’t act up when they can sense their world is about to change yet again? My dogs are being horrible, for proof, just look at my dog shaming post. 🙂 But overall, I really can’t complain. Blue Eyes is excited for a baby brother. He keeps telling me we are naming the baby Silver. Not exactly a name I would pick for my kiddo, but at least Blue Eyes is happy at the idea of another baby. I’m not sure he quite understands that the baby will be born as just that, a baby. I’m pretty sure he thinks the baby will be Snow White’s size, and they’ll be able to play right away. I feel a little bad for the surprise he’s about to get. I’m pretty sure Snow White realizes something is about to happen. All she wants to do lately is snuggle with mommy. We also found out she needs some testing for her hearing, so I’m hoping to have all of that worked out before the baby gets here. 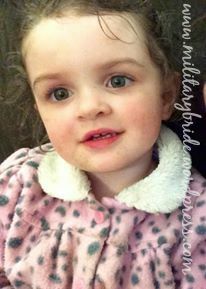 They think it’s a really simple fix, like needing tubes in her ears, but as a mommy, I will feel better knowing how we can take the next steps to help my baby girl in growing. Here’s the deal, don’t tell me we should have planned better. Every baby is a blessing, and even if it’s not the “ideal” time, I’m so excited to have this baby. To hear people act like this baby is an inconvenience is offensive and rude. And it’s not poor me. I signed up for the military life when I signed papers to enlist. I didn’t expect to marry a military man, but I knew what I was getting into, unlike a lot of wives, I knew what it would look like. I count it lucky that he’s been gone as little as he has. Since having kids, he has rarely been gone. He was gone for two months right after Blue Eyes was born, and since then only little periods here and there. He’s made it to two of our kids births, and every birthday so far. That’s rare for a military family. I count my blessings. Who wouldn’t be? I don’t want to be alone when I have this baby, and God willing my mom will be here in time. But I’m not so worried about me being here alone as I’m worried about my kids. Thankfully I have made some great friends here, that I know will take care of my babies until a family member or myself can be home. Yes, I’m sad my husband won’t be here. But tears won’t help me. What I need is to be as organized as possible. To find out if there is a chance of being able to FaceTime the birth, or if I can have someone available to send him pictures through email as soon as possible. Finding ways to let my husband be here, even if he can’t physically be here. After all, it’s his baby and he’s got more to adjust to when he comes home than people realize. He was gone most of the pregnancy. He didn’t get to see the ultrasounds. He didn’t get to see my belly grow, or feel the kicks. His gender reveal was a picture I set up with the kids so he had something cute to see. He hasn’t gotten to buy the baby clothes, or put sheets on our well loved crib. He hasn’t had the time to prepare that I have. He left with two kids and he’s coming home to three. Talk about scary! I do this because I have to. I’m not strong. I break down, and cry. Blue Eyes has become very sensitive to mommy’s crying, and tries to take care of me. But it doesn’t make me weak either. It shows my babies that I’m human, that I miss daddy as much as they do. And that’s okay. Yes! A million times yes. This is my baby and I can’t wait to meet him. This is our last baby as far as we have planned, but that makes this pregnancy all the more important. Hopefully people can understand that. And maybe it will help someone else who is giving birth alone. Posted in Uncategorized and tagged babies, baby, baby boy, birth, blue eyes, deployment, military family, mom of three, new baby, pregnancy, snow white. Bookmark the permalink. Happy First Birthday Snow White!!! My beautiful Snow White turned one!!! Mommy has been wanting to make her wear a tutu for a long time, so Snow White’s first birthday was the perfect opportunity. We aren’t having the party until Saturday, but I had to share a picture of my beautiful little girl. It makes my heart happy to see her cute little face in all her ribbons and glitter. It seems like just the other day I was announcing I was going to have her, now she looks like my beautiful little princess. 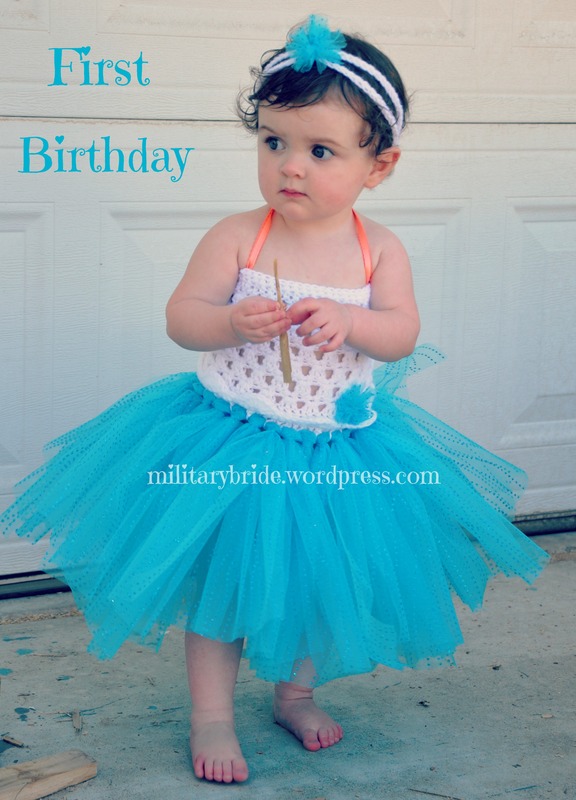 Posted in Baby, military family, Uncategorized and tagged baby girl, birthday, birthday girl, family, happy birthday, life, military family, military life, one, princess, snow white, tutu. Bookmark the permalink. There is a lot of change happening right now. If you haven’t read, we have orders and a date to leave. Hubby and I have both been finishing up our two separate degrees. Surprisingly enough, they will be done within a week of each other. That means that we have double the finals, and trying to fit in time for our kiddies in with his work schedule. To make matters worse, we found out he will be deploying withing months of being at our new Duty Station. We’ve been through deployment and underway before. But we have been extremely blessed. The last time Hubby left for two months was right after Blue Eyes left. It was a hard adjustment, but at least at that point Blue Eyes was solely dependent on mommy. This time, it’s going to be a lot harder. Daddy gets home and both kids run/toddle after him like he’s the greatest thing in the entire world. While I love the looks on their faces when daddy gets home, how will I explain when daddy’s not coming home? They will be three and almost two when daddy has to leave. I’m so grateful for friends who have already gone through the deployment with kids. They have been amazing at helping me to keep from getting sad. They’ve given me ideas for things we can do to help keep them from missing daddy. 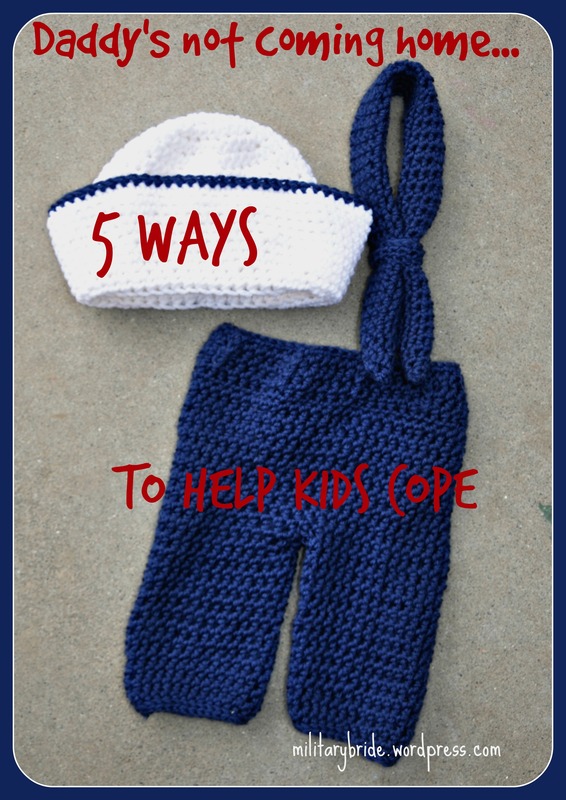 After talking to multiple military wives and kids who have gone through deployments, here is a list of 5 things people agree help their kids during the deployment. One of the best things I’ve heard is those books that daddy’s voice can read to them. Hallmark has quite a few of them, and other companies are starting to make them as well. There are other options for bedtimes stories as well. I ran across the website for a pen that will read “Anybook” that daddy’s voice has recorded. That’s amazing if your child’s favorite book is not the normal bedtimes stories. Blue Eyes loves Star Wars ABC’s, Colors, and 123’s. My friends have also pointed me to the amazing world of Daddy Dolls. We’ve been talking about getting each kid a build a bear with daddy’s voice, which isn’t a bad idea, but then we found daddy dolls. There are a ton of websites that make them for military. Different looks and possibilities, it’s really up to you, what look you want. Daddy Dolls Inc. -This site will do dolls, dog tags, pillows, teddy bears, and homecoming outfits. Operation Give a Hug -this is where you can chose to donate or request a doll. It’s great if you want to support military kids, or if you can’t afford to give your kid a daddy doll. Hugs to Go -has cute little people in uniform that you can put daddy’s face on. US Deployment Dolls -This site has several uniformed dolls and the face it put on the doll instead of a removable picture. Whether you decide to do a daddy doll or not, it’s up to you. I’ve also been talking to several friends who have created a Deployment Wall. The Deployment wall is all things daddy. Two clocks, one with your time, and one with your spouse’s (daddy’s) time. Most have some sort of countdown, or a jar of “Kisses for each day” daddy is gone. Other walls I’ve seen have maps with pins, pictures, letters, and other types of things to help them know daddy is close. And then there is the all exciting day daddy comes home…. Letting the kids get special outfits for daddy coming home can be a great way to get them excited. Do they get their own “uniforms?” Most of the time, your branch will sell kids versions in their exchange. Do they get a tutu? If you can’t make a tutu, there are many wives on base who can. Find your base spouse page, I’m sure you’ll find someone. Do they get to decorate? Make sure you do some research, some places like Build a Sign will do free banners for returning military members. By streamers, get ice-cream! It’s a time to celebrate. The wait is over! Daddy’s home! Since it’s a fact that my husband will be deploying, I have started a Pinterest board called Deployments. I’m not very good at putting the “Pin” button on my page, but you are more than welcome to check out my Pintrest board for ideas. The link for Deployments is here and the link for Military life is here. The little hat in the photo is my own design. I didn’t like the patterns I came across, so I spent a couple days designing it. Please don’t hesitate to ask if you like the design. Also, if you have any other great ideas for helping kids with Daddy deploying, PLEASE leave a comment. I’m always looking for new ideas. This article is solely my own research and thoughts. I am not a paid sponsor. 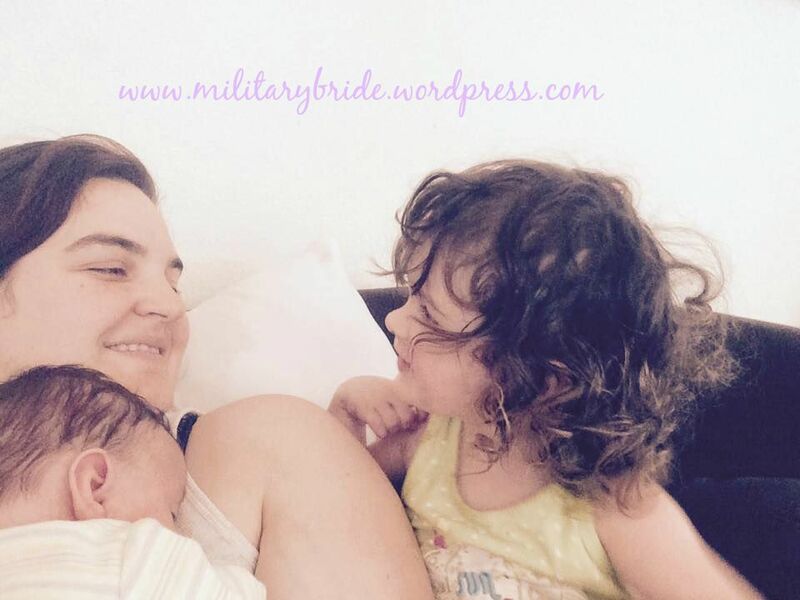 I am simply a military wife with two kids who will soon be facing the realities of deployment. 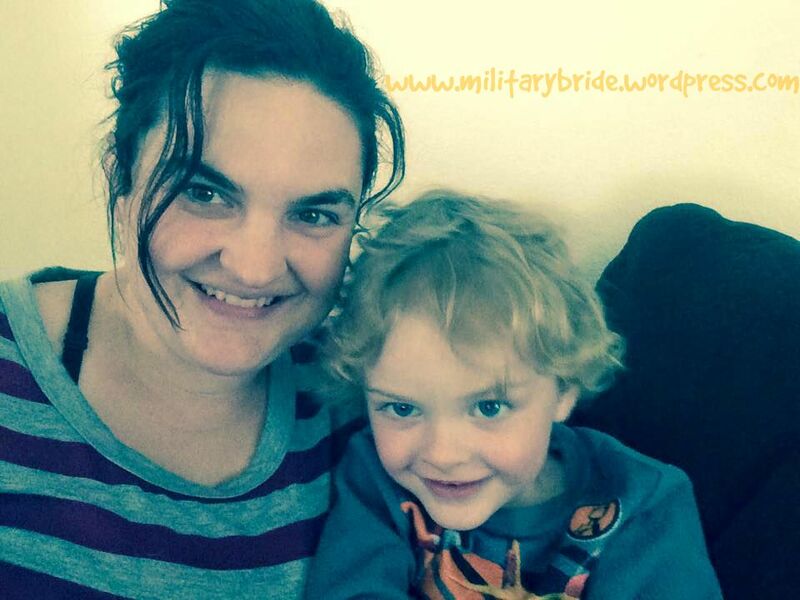 Posted in military familty, Uncategorized and tagged bedtime books, blue eyes, build-a-bear, Daddy Dolls, decorating, deployment, family, homecoming outfits, hugs, kids, kids military uniform, military, military life, operation give a hug, pintrest, snow white, star wars, teddy bears, tutus, underway, welcome home banners. Bookmark the permalink. You heard my right, I think my little Snow White ate dog food. Blue eyes was “training” the dogs today. He tells them to sit and then gives them pieces of dog food. It’s super cute and the dogs are really patient with him, but it usually leaves a mess. I thought I got all the pieces up, but I just saw Snow White spit a piece out. Don’t all kids at some point? I know we were worried for a while that Blue Eyes thought he was a dog… and they’ve both gotten their hands on dirt. So I shouldn’t be surprised that Snow White had to try the dog food. It seems like she shouldn’t be getting so big so fast. Take your eyes off of her for a moment and she’s crawled off somewhere, normally my room where there are big double mirrors. Blue Eyes loves to play in the dirt, so I’m just waiting for the day I see both of them covered in head to toe dirt. What’s funny though is that for someone who likes dirt, Blue Eyes freaks if his hand or feet are dirty. And then we end up with yet another bath. This last week I made him put Ted Ted outside of the shower while he went to play. I heard Snow White crying and went to check on her, only to come back and find Ted Ted in the shower with Blue Eyes. Since Ted Ted was already wet, I let him play. I watched Blue Eyes carefully soap up Ted Ted and then rinse him off. He sat Ted Ted on the ground and sat next to him, giving him a rubber ducky to play with. Yes, Ted Ted has become my little boy’s beloved friend. After the shower was over, he even stopped carefully to try to dry Ted Ted off, and was heartbroken when daddy had to put Ted Ted in the dryer. I often find Blue Eyes copying mommy taking care of “Sissy” with his friend Ted Ted. That little brown teddy bear is helping him understand how to take care of someone and to help someone who needs it. Some day Ted Ted will stop going places with Blue Eyes, but for now, it’s so sweet to watch him take care of his friend. 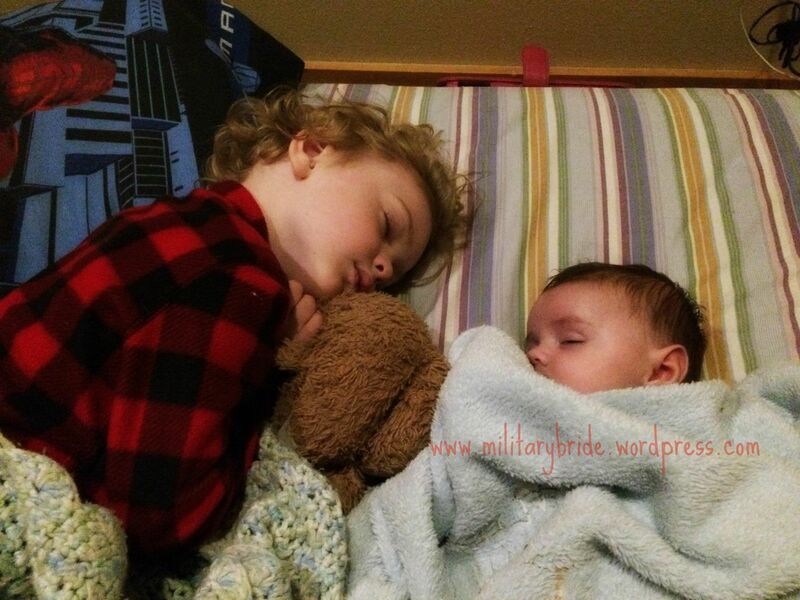 Posted in Baby, blogging, dogs, family, life, military family, mommy, motherhood, Parenting and tagged babies, baby, blue eyes, copying mommy, dirt, dog food, dog training, dogs, dryer, eating dirt, growing up, motherhood, shower, snow white, Ted Ted, teddy bear, treats. Bookmark the permalink. You have no idea the joy you bring to my life. I love you and your brother so much. Right now you are busy exploring the world. I have to admit, you have already developed mommy’s temper. It’s not a bad thing, you may get angry easily, but you forgive and forget easily too. Learning how to walk has definitely brought your little temper out. Sometimes your daddy and I just have to laugh at how cute you look when you get angry (don’t worry, daddy laughs at mommy’s temper too). Sweetheart, right now you are fascinated with music. If you hear it you have to crawl over and find out where it’s coming from. Mommy and daddy hope you will always love music, and we will do our best to let you hear all kinds of music. You do love the classical piano music, which makes mommy happy. Some day mommy will introduce you to the wonderful world of musicals and operas. We will put on our fanciest dresses and have a day out. Sometimes mommy will take Blue Eyes as well so that you can both can learn about the beauty of well composed music. 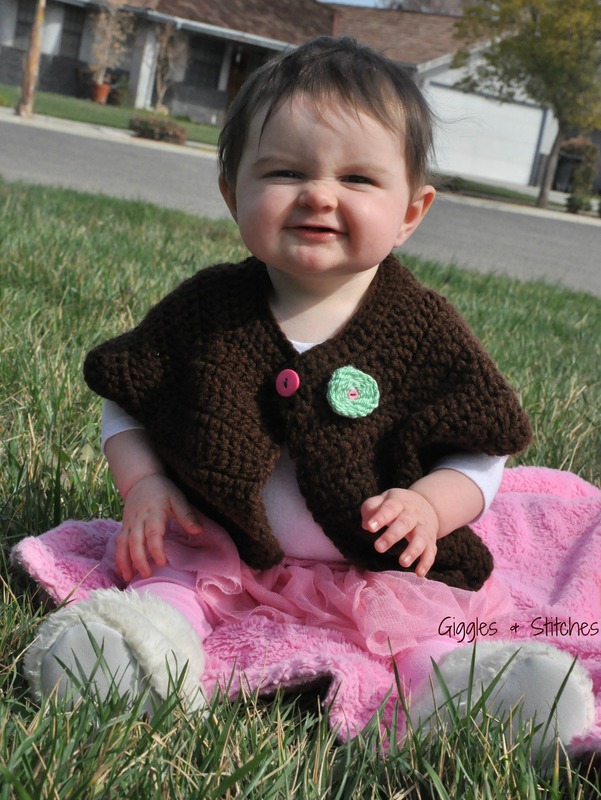 Mommy is so excited that someday we will play dress up and tea party. We’ll twirl around in dresses until you laugh. 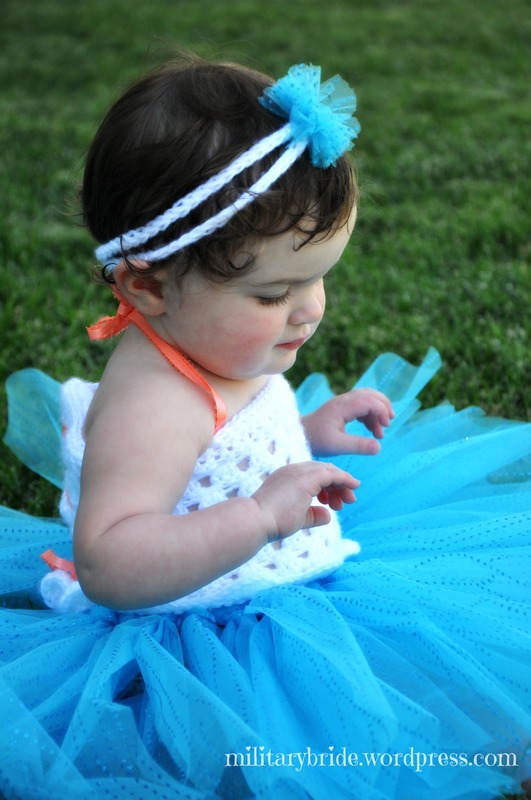 Baby girl, mommy wants you to know that if you don’t like dresses, that’s okay too. There is a time to dress up and look pretty, and there is a time when you will need to get dirty. Mommy hopes that you will learn how to be a strong woman who isn’t afraid of a little hard work, but that you will also know how to be a lady and treat people with respect. My love, you can keep your hair as long or as short as you want. Daddy and I argue about it now, but mommy will never make you wear your hair how you hate it. There are so many things mommy hopes you learn. I want you to learn to be kind to all people, even if they are not kind to you. I also hope that you learn how to stand up for yourself and for people who are not able to stick up for themselves. I want you to learn how to appreciate beautiful things, but also how to make beautiful things as well. And most of all, I want you to learn how beautiful and how much value you really have. I want you to learn that you are a person of worth and that nobody can take that from you ever. I hope you teach others how to value themselves and how to love who you are. I also pray that you will pick someone who appreciates and treats you like you are a person of value. I know you will chose who you love and marry, but mommy wants you to learn to pick someone who treats you like you are the most important thing in the world. You deserve the best, my beautiful little girl. Mommy knows you will have struggles. Mommy knows how hard it is to be a girl in a world that values the superficial. Mommy knows that you will have to learn how to stand up for yourself, and that mommy can only teach you so much. But my beautiful Snow White, I know you will have your daddy and mommy to love and support you. Mommy wants you to know that daddy loves you so very much. Sometimes he gets scared at raising a girl in todays world, but if you could see the way he looks at you, you would know you will always be daddy’s little girl. I know you will fight with your brother sometimes. But mommy and daddy hope you will realize that you are here for each other. I hope you will stand up for your brother and he will stand up for you. He really loves you even if he pushes you down sometimes. Every night Blue Eyes has to help mommy put you to sleep. He lets you play with his teddy and sometimes he will let you hold on to his blankie when your tired. That’s very special my love. Your brother doesn’t share with most people. Baby girl, I love you so much. 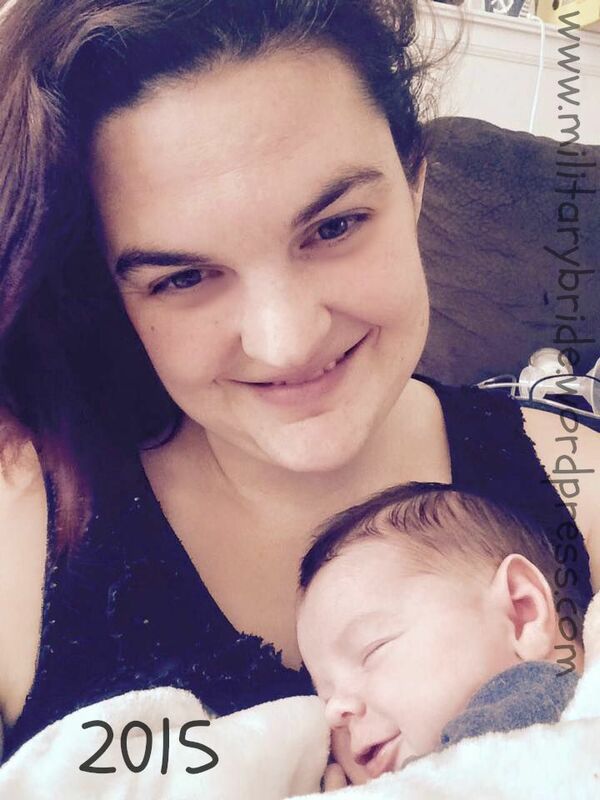 Posted in Baby, blogging, life, military, military family, milspouse, mommy and tagged dresses, growing up, letters, mud, music, princess, snow white. Bookmark the permalink. Snow White is fascinated with my camera. This morning, as I was struggling to wake up, my beautiful Blue Eyes tried shoving my feet into my shoes. “Bye Bye” he kept telling me, as he got made that the shoes wouldn’t fit right. I pulled my shoes on the rest of the way and looked around. Blue Eyes and Snow White have been getting up at six am. It’s to freaking early to be going bye bye. I was able to distract him for about an hour with his favorite cartoon, PAW Patrol. But when that was done, he started dragging his favorite blanket and two teddy bears to the stroller. I’ve given up on putting the stroller away. If it isn’t in the living room, we never go for a walk, so we leave it there. Blue Eyes put his teddy bears in the seat and tucked them in. Then he starts pulling Snow White’s blanket over to the stroller. He has given up the idea of leaving without her, so he gets her ready. There is a small box of clothes my sister sent on the desk. Blue Eyes spotted a pair of Snow White shoes and starts trying to shove them on her feet. Flip Flops do not go well with little tights. Getting frustrated, he came back over. I’ve given up at this point. I’m going on a walk. So I tucked both kids into my monstrous double stroller, and away we went. I walked and walked, Blue Eyes babbling happily about the cars we walked past and the “pup-pups” we saw. I could only make out a word here or there, but he was telling a good story. Snow White looked around wide eyed with her thumb in her mouth. Thankfully, I was able to convince her to wear ear warmers. It’s not terribly cold here, but she freezes easily. The walk woke me up. And even though it is far from a pretty walk, hearing my son babble about the things he is interested in, made me happy to be there. Walks are still magical for my little boy and my little girl. They talk, and giggle as we go. Soon Blue Eyes will be speeding around me on a bicycle, and Snow White will be my only stroller baby; but for a little while longer, I get to enjoy my two babies as we explore the world. We spent the rest of the day reading stories, coloring, working on the names of colors and counting to three. One, Two, Three, is still not clear but he says them with the same tones I do, so I’ve figured out what he’s doing. Snow White has finally become mobile, and spent her time wiggling into the kitchen and getting mad when I put her back at the starting point. We pulled the cushion off of the couch to hide behind them, while sis sis tried to stand on the abandoned cushion. 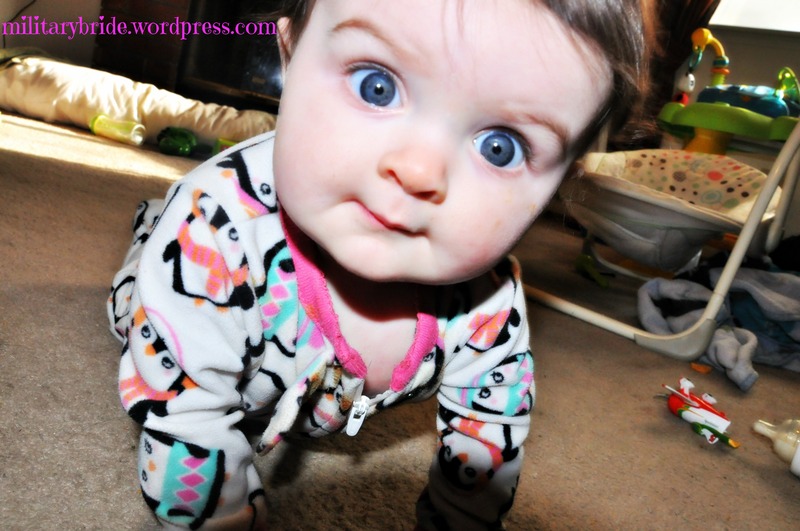 (She may decide to skip crawling like Blue Eyes did). Then we chased the puppies around. When the sprinklers went off, we watched in amazement from the little slide yelling “Water, water”. And when it was night-time, my little girl finally fell asleep from exhaustion and Blue Eyes cuddled with me for one more episode of Paw Patrol. From my babies stand point, today was an amazing day. From mommy’s view, I didn’t get a thing done. But sometimes we don’t need to get things done. We just need to watch our babies grow and explore. Posted in Baby, blogging, family, life, military family, motherhood and tagged blue eyes, childhood, children, crawling, excercise, exploring, family, Going to school mommy, hiding, life, military babies, military bride, military family, military life, mommy, motherhood, puppies, sis sis, snow white, standing, walk. Bookmark the permalink. You have no idea how relieved I am that you love your little sister so much. Right now, it’s a little frustrating when she gets a bottle in the eye, or when all 24 lbs of you tries to pick up all 10 lbs of her, but I’m so grateful that you have such a loving heart. I love that you want to help mommy take care of her. I hope that you will remember how much you love her when she is big enough to follow you around and get in the way. Right now sis sis is learning to crawl, and I know you don’t like sharing your cars, but I’m so happy you do. Some day she will discover princesses and tutus and then you’ll be left in peace with your cars and planes. I hope you remember how much you love her when you two are fighting or teasing each other. I hope you will protect her when mommy isn’t around and that you will look out for her when you two are old enough to go to parties. I hope you will protect your sis sis when you both start school. It’s scary for mommy to know you are going to grow up, but you have mommy and daddy to teach you how to be a good boy and man. Your mommy and your sister are your first examples of how to take care of your future wife. So when mommy is punishing you because you, “don’t hit girls” or making you open the door, it’s not to be mean. It’s because mommy and daddy want you to love and respect your future wife. We want you to grow into a man who deserves the best and knows how to pick someone based on quality not looks. Mommy and daddy want you to have a better life than we could ever hope for you. We want to teach you to be kind and strong. To protect those weaker than you, and care enough to rescue all of your little pup pups. We hope to teach you how to handle money better than we used to, and to value hard work. Mommy is excited to explore the world with you and your sissy. I can’t wait to take you on adventures, and to dress up to find buried treasure. I can’t wait to take you to see plays and teach you how to have tea parties with your sister. Believe me, even if you don’t like dressing up, mommy will make sure there are plenty of cookies. 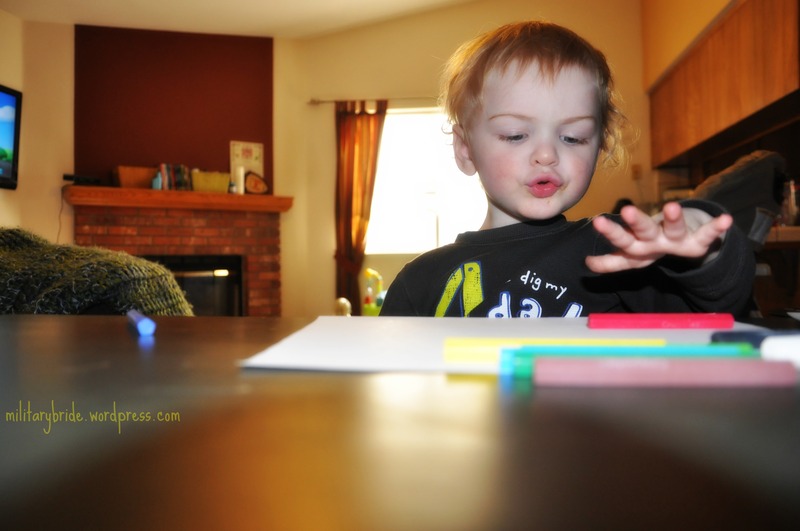 Today we color, and play airplanes. Today we pound on the piano, and splash the bathwater all over the floor. We dig in dirt and run around to the “Bananas” song. Today the dirtier the better. We steal sis sis’s hair bows and climb on the counters for cookies…. Someday, you will grow up, but for today, I’m going to enjoy you being my little wild child. Posted in Baby, boys, life, military, military family, milspouse, mommy, motherhood, Parenting, Uncategorized and tagged adventures, baby boy, baby girl, blue eyes, boy, brother, children, coloring, crayons, dirt, family, future, growing up, kids, life, military family, military life, mommy, mommy and daddy, motherhood, sister, snow white. Bookmark the permalink. We all start the New Years with great intentions. We have so many things we’d like to do better, traits we’d like to be better at. The reason most of us fail in our resolutions, is that it isn’t something that hits home. You can’t automatically become great at running, eating right, etc. It requires one small decision every day.So I’m saying screw the New Year Resolution this year. I’ve been taking an inventory of my life, and I don’t have just one thing I’d like to do better. I’d like to re-straighten out my priorities, and live this coming year to the fullest. My dad gave my husband and I a series on finances. NOT because we are irresponsible, but because we want to change the way we think. Leave a legacy for our children, instead of barely scrapping buy. We were happy to see that we are already doing some of the things they recommend, like an emergency fund or setting a budget every month. Other things we were doing, but somehow lapsed in the last six months. Giving ourselves an allowance was a huge one. We found when we actually give ourselves money we are less likely to go on “spending” sprees. I’ve been off the computer for a couple weeks. Why? Quite honestly, I am a computer addict. I spend hours looking at the screen and then I can’t tell you what I just spent my day doing. So after a talk with my husband, I left my computer at home. I took a vacation with my family and left the computer, finished up my few projects and turned everything off. Even my phone stayed mostly off. It was a nice little break. It was hard though. I had to decide to live in the moment and not try to capture pictures on my phone. Not text six million people or respond to things that shouldn’t have my time anyways. It was hard. But honestly, I think I need to do it a little more often. My babies will only be little once. Heck My Snow White already has two teeth and wants to eat people food. Blue eyes? Well he’s still my wild child, but now he wants his “colors” and “Cars” and “Water”. He’ll even lead me over to the shower and try to turn it on or ask for a “towel” when he’s all done. Time flies to fast for me to keep living the way I do. School shouldn’t come first. Neither should days so full that when I go to bed I’m beyond exhausted and I can’t wake myself up when the kids cry. So to all of you wonderful readers out there. Keep this year about the things that are important. Take one step a day in that direction and soon resolutions won’t even be needed! You’ll be headed in the direction you want to go. 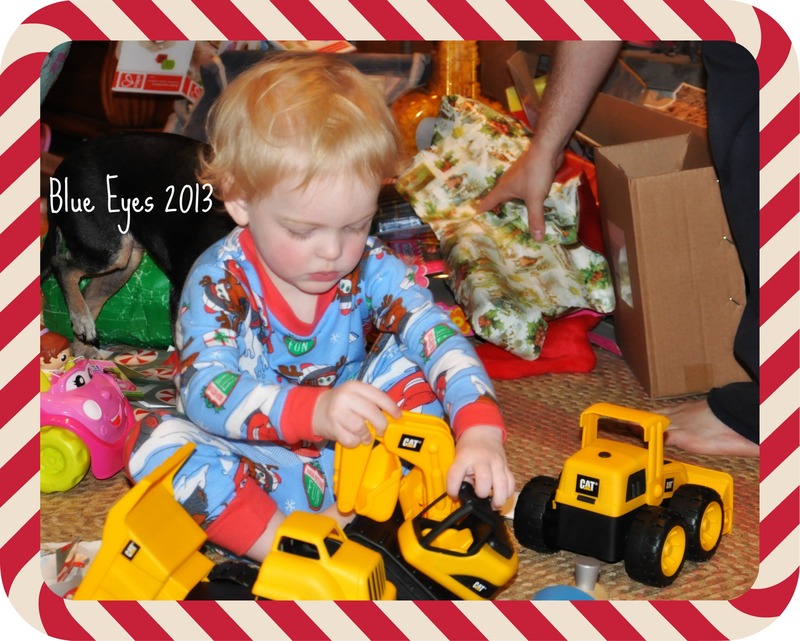 Posted in life, military family, mommy, motherhood, Uncategorized, wife and tagged blue eyes, breaking resolutions, car, christmas, finances, good intentions, grandpa, money, motherhood, new year, new years resolutions, resoutions, screw the resolution, snow white, spending, words. Bookmark the permalink. Please give credit, where credit is due.